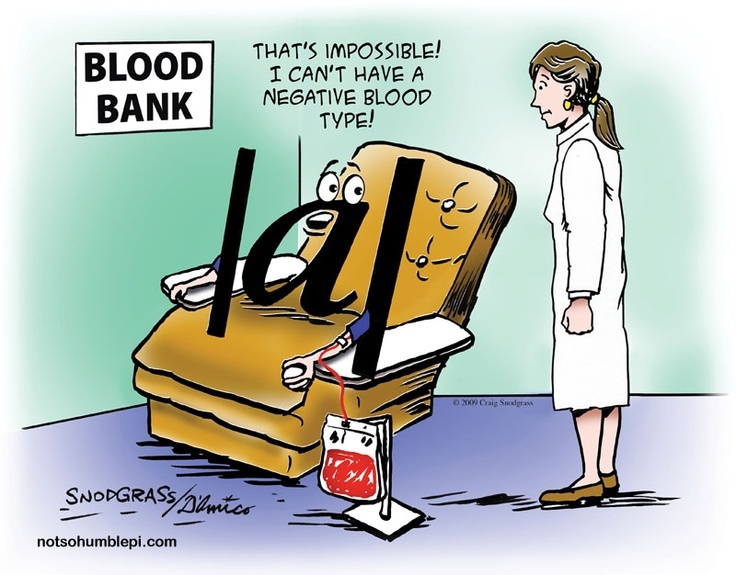 ← Class Opener – Day 46 – Correlation Does NOT Mean Causation! My students have seen absolute value equations and inequalities before, mostly as a stand-alone unit with a series of special rules to memorize. But I find that students have rarely been asked to think about solutions to inequalities as the comparison of values between two functions. So instead of re-hashing some old rules, let’s fire up the netbooks and look at some graphs! 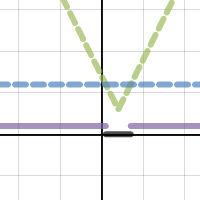 The Desmos desmonstration here (it’s clickable) allows students to experiment with the parameters of an absolute value function, and compare to a constant function. Before diving into some specific problems, I allowed a few minutes for partnerships to play and try to summarize any relationships they saw. Very few saw an immediate link to what we have already been working on – inequalities – and the best was yet to come. 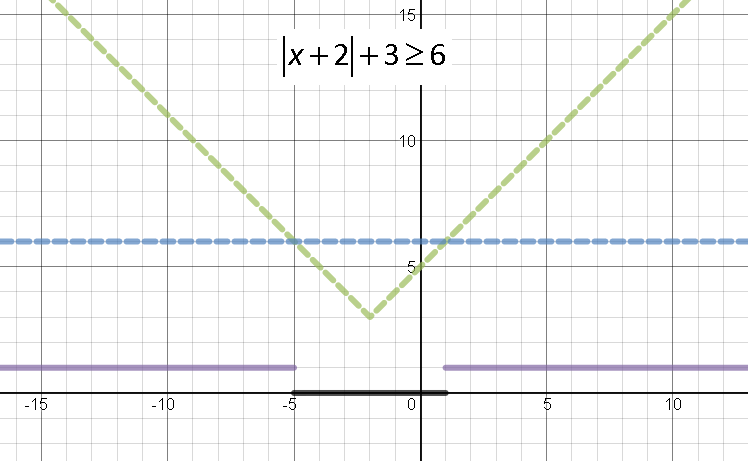 The graph then lets us analyze the relationship between the absolute value function (dashed green) and the constant function (dashed blue). How does this graph allow us to find solutions to the given inequality? When is the green “above” the blue? What does this indicate? When is the green “below” the blue? What does this indicate? Where do the green and blue intersect? Finally, students began to understand the meaning of the black and purple lines on the graph – representations of the “greater than” and “less than” solutions sets. Wondering how many will immediately whip out Desmos on their cell phone….hoping they do! I’ve been toying with this idea too. Also playing with how the numbers are connected to the graph. https://www.desmos.com/calculator/jvdfhmlirn Someday we’ll be able to print values for measures on graph too.